The rolling North Wessex Downs encompass some of England’s finest landscapes. The North Wessex Downs Area of Outstanding Natural Beauty (AONB) was created in 1972 to conserve and enhance the natural beauty and tranquillity of these landscapes. The North Wessex Downs AONB stretches across parts of Berkshire, Hampshire, Oxfordshire and WiItshire. 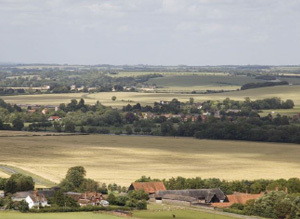 At 668 square miles (1,730 square kilometres) it is the UK’s third-largest AONB. Among its jewels are some of the largest tracts of species-rich chalk downland in southern England and world-famous chalk streams, together with ancient woodland, veteran trees, arable farmland, river valleys, heaths, commons, ancient monuments and historic settlements. Since 2001 the North Wessex Downs AONB Partnership of nine local authorities and a wide range of community interests has led efforts to conserve and enhance this nationally protected landscape. Following several years of collating and refining information relating to the historic landscape character of the North Wessex Downs, in 2015 we successfully bid for Heritage Lottery funding to help turn this rich resource into something accessible and useable by all those living and working in the AONB: Sharing Historic Landscape Character in the North Wessex Downs. promoting all these elements through wider AONB print and digital marketing. The Sharing Historic Landscape Character project has been supported by a grant from the Heritage Lottery Fund. Thanks to National Lottery players, we have been able to run workshops to promote understanding of historic landscape character; find out how local people would like to see the information we have gathered presented; build an interactive web site to enable easy access to information about the historic character of the North Wessex Downs; and present this to local stakeholders, with a chance for them to try their hand at some fieldwork, at our first ever North Wessex Downs Heritage Forum. At the beginning of the work encapsulated in this website the North Wessex Downs AONB had an existing landscape character assessment (Land Use Consultants 2002) which identifies unique single areas of particular landscape types within the AONB like chalk river valleys such as the Kennet. It also has a complementary Historic Landscape Characterisation (Wyvern Heritage and Landscape Consultancy, 2012; Conway 2007), developed over several years as resources allowed, which characterises the distinctive historic dimension of today’s landscape. This is a complex and multifaceted database concerned with ‘time-depth’ in the landscape, as well as present day character comprised of recurrent (but not necessarily geographically discrete) Historic Landscape Types. This database has been used as a basis for the identification of more strategic Historic Landscape Character Areas,(Wyvern Heritage and Landscape Consultancy, 2015) which are akin to Landscape Character Areas in that they identity geographical discrete areas with distinctive historic environment characteristics. These highlight surviving ‘time‐depth’ and how much of the past we can read and enjoy in the present landscape. 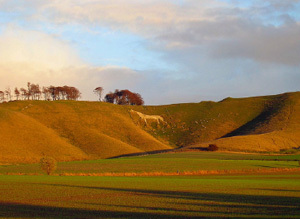 They identify the North Wessex Downs landscape’s cultural, historic and archaeological attributes and the importance of change through time as a primary characteristic. They provide a systematic overview of the characteristics of the historic landscape in the AONB and identify the special qualities and features of significance within it. The Story of the North Wessex Downs Powerpoint Presentation. Below is a video journey through the North Wessex Downs Area of Outstanding Natural Beauty including shots of rolling downland, woodland, and other landscapes together with the history of the area such as Avebury World Heritage Site, Savernake Forest and the Uffington white horse.